For many people, saving up a million dollars seems like a pipe dream. But it's not as hard as you might think. It just requires a combination of savings, time, and patience. If you set aside $300 a month into the Vanguard S&P 500 Index Fund (VFINX) starting in 1985 and increased your monthly contribution by the rate of inflation, you would have $1,090,458 by the end of April. Over this period, despite the monthly contribution growing to over $700 per month (because of inflation), the hypothetical investor still only had to contribute about $208,000 in total savings to exceed the million-dollar threshold. Not bad. But the savings aspect wasn't the hardest part. The "staying-the-course" part was. The hypothetical saver had to sit tight through a -29.8% decline from September to November of 1987, a -44.8% decline from March 2000 to September 2002, and a -51.0% loss from November 2007 to March 2009. Of course, earning a higher investment return would have helped too. Nobel Prize-winning academic research has found various types of stocks have higher expected returns than large company, blue-chip companies. One example is smaller cap stocks (value stocks are another). They are riskier but have historically delivered higher long-term returns. If our hypothetical saver funneled their monthly contributions into the DFA US Microcap Fund (DFSCX) instead, their portfolio would be worth 50% more today -- $1,536,855. Higher returns result in greater wealth, but they can also be used to reduce the amount of required savings. At just $200 per month (adjusted for inflation) into the DFA US Microcap Fund, our hypothetical saver still would have surpassed the $1M mark, with $1,024,582. This result only required $135,000 of total savings. 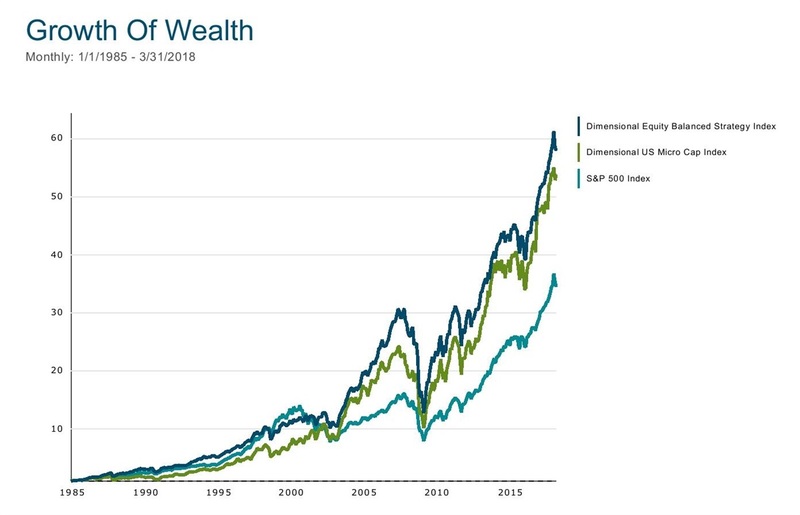 One word of caution --- I used small-cap stocks as a way to illustrate higher long-term returns, not as a suggestion that savers should put all their contributions into small companies. Instead, a diversified portfolio of large/small and growth/value stocks in US and non-US markets will be your best bet. Diversified portfolios have less risk than individual asset classes, and the whole often turns out to be greater than the sum of the parts. In the chart below, we find the diversified DFA Equity Balanced Strategy Index actually exceeded the return of the DFA US Microcap Index (which itself is 10% of the DFA Index) with 20% less volatility over the entire period. Clearly, along with savings, time, and patience, diversification helps too.